Think about your idea of a perfect journey. With Jeep® Renegade and the Uconnect™ LIVE services driving becomes an experience to share at 360°. Music, entertainment, social networking, news and maps and much more. Discover the first vehicle in its category to provide the ability to measure its own performance. Stay connected with your world and be constantly in touch with your all your passions. Comfort and entertainment on board are assured thanks to the Uconnect™ Radio LIVE touch screen, either 5″ and 6,5″. With compatible Bluetooth® smartphones you’ll always have hands-free control of your music, messages and calls. In addition, Uconnect™ 6,5″ Radio Nav LIVE offers a navigation system with premium outstanding 3D graphics and Assisted-GPS sensors to ensure accurate positioning in areas where GPS signals may be obstructed. With Jeep® Skills, new update on your Jeep® Uconnect™ LIVE, you’ll also have control of driving data, parameters and trails. 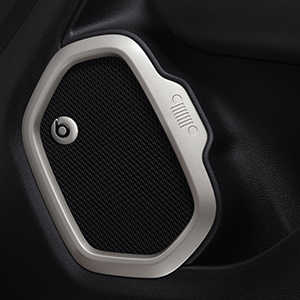 Your driving experience will never be the same thanks to the audio system with multiple speakers and subwoofer. Disclose the details of the superior audio systems now available with the Uconnect™ system. Listen to your favourite music by simply connecting your compatible media device. With Bluetooth® streaming and AUX port, Uconnect™ allows you to easily manage your device in numerous ways. Bluetooth® streaming will allow you to wirelessly stream music on your media device. With this available feature you can now easily stream music wirelessly from any compatible media device or Internet radio app. Uconnect™ system offers you a flawless experience you would have never expected. With navigation and entertainment systems and voice commands you can call whenever you want to. The volume of your music is automatically adjusted so you can listen to your incoming calls and then restored at the end of the call. Finally, as you enter the fast lane, voice commands make it easy to call your contacts or call back your last number. Uconnect™ has joined forces with leaders in navigation to make sure you know where you are, your destination, and how long it will take you to get there. Maps will guide you through traffic, while merging and turning using sensor assisted GPS. Turn-by-turn guidance is provided through audio directions and voice prompts. The new Uconnect™ 6,5” Radio Nav system features a large 6.5 inch touchscreen, with 3D graphics and a series of external selectors for a more exhaustive and efficient access to all functions, including audio system controls. The Bluetooth® connectivity includes voice commands and streaming audio. The Uconnect™ system further supports USB port, SD card reader and DAB radio. 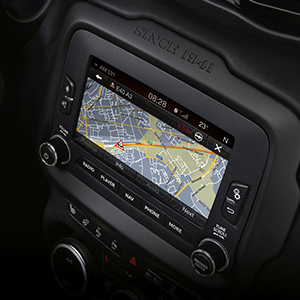 The Uconnect™ 5″ Radio Nav system takes your lifestyle on the road combining in one solution: multimedia, entertainment and TomTom navigation. Furthermore the touchscreen and hands-free functionality make control rapid and automatic. 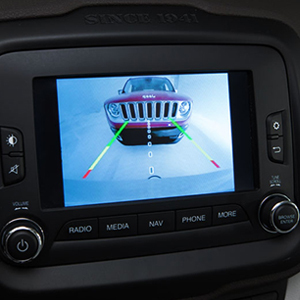 The new Jeep® Renegade offers leading-edge technology allowing you to control everything in a simple and intuitive way. The segment’s largest full-color instrument cluster display, available standard on Limited and Trailhawk, allow you to customize the screen with as much or as little information as you desire using buttons on the steering wheel. With easy-to-understand icons and instructions, the display offers you a wide range of customization options, from a basic speed readout to specific vehicle status information and in the 4WD version also the possibility to check the Selec-Terrain® mode.